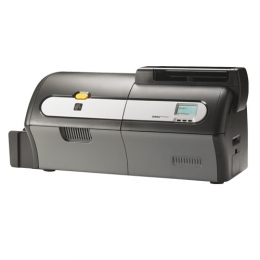 Are you looking for a card printer which delivers perfect cards in large quantities Then you have found your printer, with the Zebra ZXP Series 7. It stands apart from the rest, particularly when it comes to demanding applications in print shops, retail, hospitality, even in education. For special security requirements encode smart cards, magnetic stripe cards and RFID cards easily with the ZXP Series 7. The ZXP Series 7 prints very quickly, since it simultaneously performs three duties encoding, printing and laminating. The results top quality plastic cards at conveyor belt speed with a photo-like quality. With the extra-large card tray and FIFO mechanism, the Pro variant is ideally suited for usage as a printing station for larger card series. With the efficient Zebra ix color ribbons you keep the cost per card, as well as maintenance costs, low. Handling is simple the color-coded LCD control panel intuitively guides even the most inexperienced user. The printer automatically adjusts to the newly inserted cards. Integration of the printer is easy, thanks to Windows drivers, USB, Ethernet and optional 802.11 b/g Wi-Fi.